These looks fancy and fantastic. I love your serving dish. How pretty and fun! 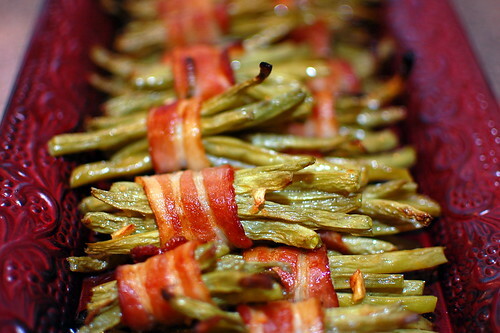 Are the green beans still crunchy at the end of the baking or are they pretty soft by then? They were softer than I typically would eat my green beans, but they did have a little bit of a crunch to them... I think putting them under the broiler for a few minutes helped. I think if you parcooked the bacon in the microwave before wrapping it around the bundles you could bake them for even less time and have crunchier beans. I am really enjoying all of your recipes. YOU are quickly moving up the ranks as one of my favorite blogging chefs! Great work in all that you put into this. Thanks for sharing your passion! Wow! These look amazing! Excellent photo. That cookbook is on my wish list at amazon. Everything I've seen from it looks wonderful, and your green beans are no exception. My mom makes these every Christmas! They're SO good! Yours look wonderful! Just found your blog from The Novice Chef's blogroll and wanted to tell you how much I enjoy it! I read your year in review post and now I want to make everything listed! YUM! I just wanted to thank you for this recipe. I have made it dozens of times since discovering your version here and everyone has raved over it. 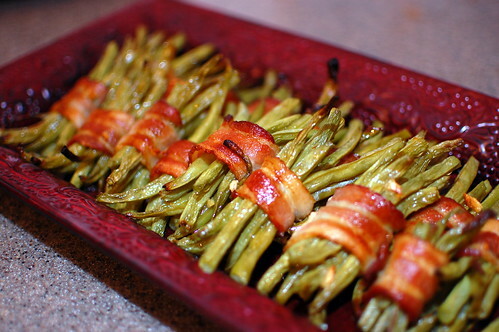 I adapted it for asparagus, and it is equally divine. Thanks a million! These look great and are perfect for a side dish for a dinner party. Do you think I could cook them at home then broil them at the host house just before the dinner?